If you’re like most people, you probably think you’re a better-than-average driver. An interesting study by the Swedish psychologist Ola Svenson showed that more than 90% of people both in Sweden and the United States thought of themselves as better-than-average driver. A similar study some years later asked business executives how good they were at running their business. Again, a vast majority of the business leaders told the researchers that they were better at running their business than the average business executive. Mathematically speaking, 90% can’t be better than average, so either people in the survey were not telling the truth or they simply had no informed way to answer the question. The study shows that people have no idea how their driving compares. So, if people haven’t got the faintest idea about their skill at a simple thing such as their driving, how well do they understand something far more complex such as their financial welfare? or what type of investments they want. People may have opinions about these matters – just as they have an opinion about their driving skills – but the truth is that they just don’t know. So, how do you know how to solve your client’s financial problem? One of the unintentional consequences of solving your client’s financial problems is that you are forced to assume that people are rational: aware of their needs, fully informed of all their choices, and capable of articulating their real problem. The reason is simple. It’s very difficult to solve a problem you can’t measure objectively. In fact, it’s really hard to even find your client’s problems which can be deeply personal, cannot be decoded into explicit descriptions and requires a lot of right-brain interpretation. A simple answer by your client misses most of what matters about finances. To deal with this problem, financial planners base their problem solving on what can objectively be described, quantified and analyzed without too much interpretation. They focus on the numbers. But what do the numbers actually say? Are You a Financial Planner? Do You Want to Know Why People Don't Buy Financial Planning? 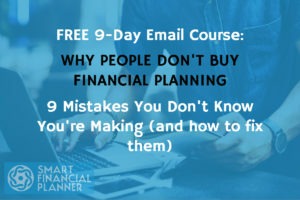 If you want to boost your financial planning sales kills, you might want to check out this free email course. Just fill in your best email here below, and you'll receive the first lesson right into your inbox. LEGO, one of the most respected toy companies in the world. Somehow, the company had completely lost touch with its core customers. Yes, of course, LEGO is a fantastic brand. However, LEGO forgot about the actual experience of their fans – young kids. Instead of speaking to the real LEGO fans, the expanded brand offerings were communicating with theoretical customers. LEGO objectively analyzed that the digital space was bringing so many bells and whistles to the play experience, they assumed that its old-fashioned bricks could not compete with the excitement. But how about the interpretation? The experience? How about how kids feel about LEGO? Jørgen understood that the company needed to understand children’s’ desires in a much deeper and meaningful way. That’s why he reframed LEGO’s problem away from focusing on the numbers. From there, LEGO was able to create and design key insights that gave it a genuine perspective on its market. LEGO went from looking for opportunities for growth in other market segments and diluting its brand, to putting the focus back on the brick and the building system that children of the digital age still love. What if you didn’t focus on the numbers anymore? Now, I’m not an analyzer of data but I do have years of experience in the financial planning arena. And based on my experience here are “The 5 Discoveries About The Reality of Financial Planning”. There aren’t many people who know exactly what they want and who then actually go out and hire a financial planner. In fact, it turns out that people are far more chaotic creatures. People rarely know what they want. So, we should educate them so that they understand how they can benefit from financial planning, right? Educating people is not enough. Why? You might think that people actually care about financial planning. I’m sorry, they don’t. Your clients simply care less about financial planning than you are. In fact, they couldn’t care less. It turns out that people hate change. They behave consistently with their former financial decisions because being consistent is mostly in their best interest. So why even bother to change? People fool themselves into believing that the assumptions of their current financial welfare will also hold true in the future. People tend to seek out opinions and facts that support their original beliefs and hypotheses about their financial welfare. In fact, people tend to remember only those facts and experiences that reinforce their assumptions about their finances. 1. Stop creating problems for your clients? Because, really, you are using a tactic from the previous century where you were fully informed and your client was left in the dark. However, the balance has shifted. If your client has access to Google (and because of that has access to the same information you have access to) along with the means to talk back, well, you need to be aware. 2. Stop selling financial products? 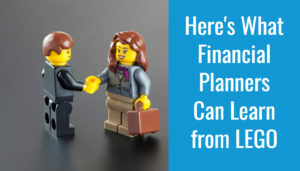 Isn’t a financial planner supposed to sell financial advice? Because if you aren’t, you are still stuck somewhere between 2000 – 2007. You see, people are looking for unbiased business partners who can brainstorm with them, who uncover new opportunities and to whom it doesn’t matter if they close the sale at that moment. 3. Stop closing the sale? Maybe you’re thinking about passing all the fuzzy in-depth questions because that takes time… It might have worked like gangbusters throughout your whole career, where every utterance served a single goal: pushing the transaction and getting the person across the table to sign the line which is dotted. You might have used the ABC-tactic. The Always-Be-Closing-tactic. However, I believe it doesn’t work when planners don’t have much of an information edge anymore. Now, you might think that these old tactics still work. This means that you don’t want to be part of this new reality. And I support you. You see, I’m not saying that any of these strategies are ineffective. On the contrary, they still work. They just produce mediocre results for you. If that’s all you’re looking for, then go ahead. Use them. But if you want to be really successful AND meaningful to your clients, well, you probably want to know what works today. Not only use your analytical, left-brain capacities. Also use your emotional, right-brain potential. If you think back to your best teachers in school, they didn’t just teach you information. They brought the information to life, not only helping you understand it but helping you feel it. You can do the same thing. Instead of giving your clients a financial plan to accomplish their goals, give them a surge of feeling to go with it. First, in the past, the best planners were adept at accessing information. Today, they must be skilled at curating it – sorting through the massive troves of data and presenting the most relevant and clarifying pieces to their clients. Second, in the past, the best planners were skilled at answering questions (in part because they had information their prospects lacked). Today, they must be good at asking questions – uncovering possibilities, surfacing latent issues, and finding unexpected problems. That’s why planners need to use data. And not just any data. Unique data. Do you have the guts to ask questions no one has never asked before?. One of the easiest ways to create a meaningful financial planning service is to just go into greater depth than anyone else has before. Don’t know your client. Understand your client so you know how he feels. If Apple has proved anything, it’s that design matters. A lot. And your financial planning service is no exception. The secret to success in anything is doing what other people are unable or unwilling to do. Most planners are afraid to ask tough questions. To really go into depth. And that’s exactly the reason why I do it. Not only because it’s meaningful, I also do it because it brings me success. However, you might be afraid to ask tough questions. Don’t be. It’s the easiest place to start. You don’t even need talent. You just have to exercise. Yes, it takes guts, but hey, if it were easy it wouldn’t work. And if every financial advisor would do it, it would quickly become worthless. On the contrary, the difficulty of this right-brain approach is precisely what makes it valuable. If you dare to implement it, you become almost unbeatable in your space. And what about becoming successful with your financial planning service? Are You a Financial Planner? Do You Want to Avoid the 9 Mistakes You Probably Don't Know You're Making About Financial Planning Sales? If so, you might not want to miss this free email course. I appreciate the time that you take to write your highly blog. Everything I have read that you have written has struck me as highly insightful, interesting, practical, and easy to read and digest. I believe that your focus on right brain processes is “right” on target. In a lot of ways, you are the Patrick Lencioni of the financial planning world. Hi Ronald. The \”average\” questions and the rationale are brilliant – an excellent way to get into your article. I also like your Leggo example, having used them as an illustration mechanism to promote unit trusts many years ago. What I particularly enjoyed is your down-to-earth approach to the subject. We\’re constantly bombarded with rhetoric around lifestyle financial planning and what goes with it. And yet the focus, all too often remains on the adviser not the client. To me, you said what needed to be said in an easy to comprehend fashion. I will definitely pass it on. Let’s try to answer a fundamental question: What is a business? A few different answers are: a way to make money; a service; the backbone of the economy. Fundamentally though, it is a system for consistently supplying significant value to clients. That is why businesses exist and why tough questions need to be asked so that one can supply that significant value at a deeper level than the client has ever experienced before. One of the problems that I’m having is “asking the tough questions”. Not that I’m afraid to (I think) … but because I don’t know what the tough questions are. Could you give me some examples of the “tough” questions … AND how to “weave” them into a client meeting. I like to have an agenda and structure when I meet clients – I like structure. Hi Shane, thanks for your thoughtful reply. You might want to check out the Conversations with Results course. Because there are dozens of examples inside.